I will keep you apprised in BC's goal for our first GOLD; as well as Nancy and my personal goal to stop at every Tim Horton's in the city. Wish us luck. Day 2 saw some very good results and some hard fought losses. Our Juniors rebounded with an expected win over an improving Nova Scotia team, 11-4. Next, their opponents were Ontario. This exciting game concluded with the good guys beating Ontario 5-4. This put us in the a tie for 2nd place at 3 wins and 1 loss. Saskatchewan. The Belles split their games with a 5-3 loss to Alberta and a 4-3 win (and stressful game for the parents) over Saskatachewan. The TSN Turning Point of the game was when we scored at the beginning of the 2nd period while we were two players short. The Open teams also won one and lost one today. The beat Nova Scotia handily, 10-3. But, they had a difficult game against the defending champions Alberta losing in a even contest 5-4. Both the Belles and Open teams have similar records as the Juniors - 3 wins 1 loss. All three teams are currently tied for 2nd in their respective divisions. We were also able to hit two more Tim Horton's in our travels today. That makes 5 stores, only 23 more to go. And you thought I was joking about Moncton being the City of 1000 Tim Hortons. 2 more Tim Hortons to be visited. Three's a charm! 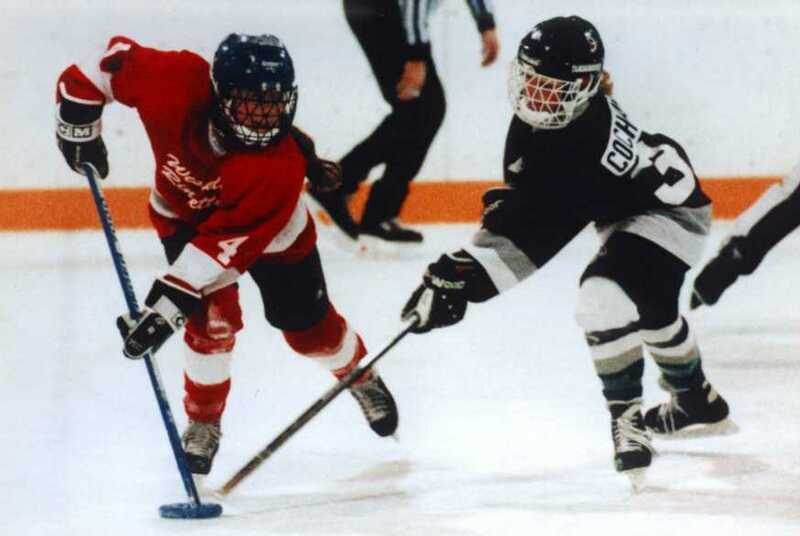 Day 3 turned out to be a perfect day for BC at the 2001 Canadian Ringette Championships. Not only did the sun make an appearance today for the first time this week, but we won all six games including two resounding wins over contenders. All three teams started the day with records of 3 wins and 1 loss. And all three teams ended the day at 5 wins and 1 loss. The Juniors began with a game against New Brunswick. They won this easily 8-1. Next came the ever powerful Alberta team. BC put on an exhibition of brilliant teamplay as they demolished Alberta 9-2. The Belles had a relatively easy day as they beat both the Host team and New Brunswick quite handily - 7-0 and 8-1, respectively. The Open team started their day with an easy 4-0 win over New Brunswick. But their second game was simply incredible as they easily handled the mighty Ontario team, defeating them handily 8-4. The only disappointing thing of the day was the fact that we only made it to one new Tim Horton's store. We're falling behind in our goal to hit at least half of the stores in the Moncton area. We'll need to pull up our socks (or is that rrrroll up the rrrrim) if we are to achieve our goal. The day proved to be quite a test for our BC teams. With the round robin coming to a close, the games became more and more difficult with the teams not only fighting against some of the best teams in Canada, but also fatigue. Playing 9 games in 5 days does take its toll. In the end though, BC is guaranteed medals in both the Junior and Open divisions (the colour to be determined). And, if the Belles win their game tomorrow, we will be guaranteed 3 medals in 3 divisions. Not too shabby. The toughest schedule of the day belonged to the Belles who played Manitoba and Quebec. They split those games winning 9-8 over Manitoba and losing 5-3 to Quebec. They take on Ontario in their last round robin game tomorrow. Both our Junior and Open teams started their days off with easy victories over PEI: 10-3 and 9-2, respectively. Their last games proved to be very tough. The Juniors took on Quebec while the Open team took on Saskatchewan. The two teams secured spots in the medal rounds with the Juniors winning 5-4 and the Open team winning 7-4. We're well on our way to winning not one, not two but three Gold Medals. Nancy Hesketh and I were also able to bounce back by hitting 2 new Tim Horton's. That makes 7 in 4 days. Only 8 more to go. That means a lot of coffee in the next 3 days. We'll take it for the team. Wish our teams luck by sending them a fax c/o Rick Daly (room 320) at the Crystal Palace Best Western (506) 858-5486. Well the journey is nearing an end, and we can see the pot of GOLD! Like Meatloaf (I guess I'm dating myself) said it so poetically - Two Out of Three Ain't Bad. Manitoba in the Finals. A chance to avenge the loss on the first day of competition. The Open team played Quebec in the Semi Final, and all I can say is "What a Game"!! With BC leading 6-3 late in the 2nd Period, Quebec rallied to tie the score at 6 with 19 seconds left. But, our team was not to be denied. Off the free pass at centre, 2 quick passes to a wide open Kim Beach and she roofed it to give BC the lead and the win. The heartbreak of the day was the fact that although our Belles lost a hard fought battle against Ontario, 6-4, we were still alive for a medal. The only thing we needed was for the Alberta team to go undefeated in the round robin with a win over Saskatchewan. Unfortunately, Saskatchewan won in overtime and this eliminated the team from medal contention. The teams should be proud of what they have accomplished. And, they never gave up at all this week. Tomorrow's date will go down in BCRA's history as the day BC won, not one but two GOLD MEDALS. If you wish to fax any well wishes to our teams, please fax them to the Crystal Palace Best Western c/o Rick Daly (Room 320) at (506) 858-5486. There is a SILVER lining for BC!! Well, BC is still searching for their very first gold medal. But, 2001 proved to be BC's best showing at the Canadian Ringette Nationals ever. We won 2 silver and finished tied for 4th. Not too shabby for the only province west of the Rockies. Alberta. The game went back and forth, but in the end the Alberta team prevailed 5-2. Congratulations to all our players on all three teams, as they represented the province very well. Tonight is the Athletes' Banquet where all-star awards will be presented to outstanding individuals who contributed to their teams. I am sure I will be reporting to you that several of our players will be awarded these accolades.